Sad news has reached us that Steve Christmas (Pontypool and Nelson Chess Clubs) passed away on 6th March. Those who knew Steve might also have known his oldest daughter Rose Christmas, a keen chess player like her father. Steve also leaves a wife Theresa, and younger daughter Cherry. The Management Board wish to extend their sincere condolences to Steve’s family and friends at this very sad time. The funeral will take place on 1st April 2019 2.15pm at Thonhill Crematorium. As the 2019 WCU AGM is on 7th April, would all WCU members please note that the following Management Board posts will be vacated at the meeting and that volunteers are required to fill these vacancies. 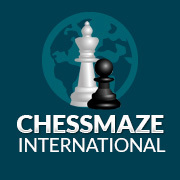 Would anyone interested in filling either of these posts please inform the Executive Director (email – executive director@welshchessunion.uk) as soon as possible. 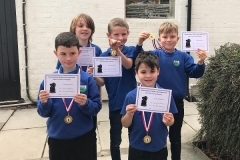 The Welsh Primary Schools Championships took place at Merthyr Tydfil on 9th March. The Championship attracted 24 teams and also 32 individual players. 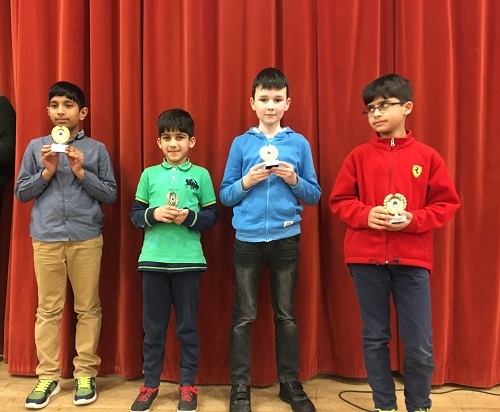 The Individual Championship was won by Anshul Swamy. The report by Olivia Smith can be viewed here. The newsletter can be viewed here. 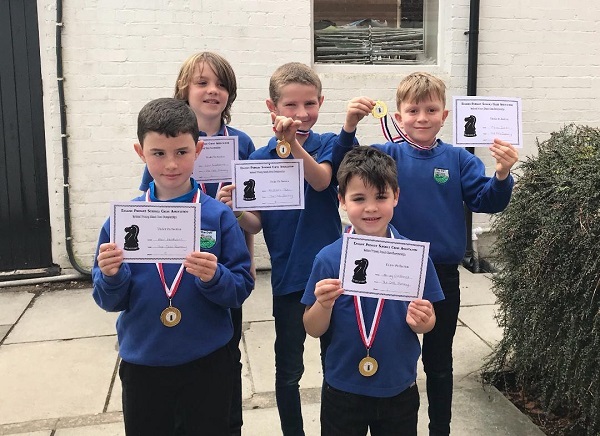 On Saturday the 2nd of March St John’s College hosted the south west regional qualifying round for EPSCA (English Primary Schools Chess Association). St John’s college and Caedraw participated in the under 11 category while the Dell took part in the U9 category. In the under 9 category Dell did very well by comfortably winning their age category with 14.5 points and qualified for the semifinals. In the U11 category 12 teams consisting of 10 schools took part. St John’s college scored 21.5 points out of a possible 25 points and pipped Brookfield school of Swindon to 1st place. Both teams went into the final round, tied on first place with 16.5 points each. St John’s won all their games in the last match whilst Broadmead faced the debutante school Caedraw. The match went into the last game on board one where Tabitha Ryan secured an unexpected win against Broadmead’s board 1 player Zoha Ashraf who has an ECF grade of 121. Caedraw meanwhile finished joint fifth and secured a qualifying place for the semi finals. Anyone for chess in Cuba in May? In this the ninth year of the competition in memory of Geof, the judges, Stuart Hutchings, Dave James and Howard Williams, looked at 21 games which met our basic criteria. In short, these are wins or draws by Welsh players against foreign opposition rated both 2250 or over and 150 points or more above the Welsh player. The number of games was perhaps rather disappointing for an Olympiad year. Outside that event (six games) and the European Club Cup where members of the White Knights team, the sole Welsh entrant, managed five games, only ten qualifying games were identified. The most prolific contributor to the list was Jon Blackburn, Wales’ latest FM, with four games. Mention should also be made of Sam Jukes whose relatively low rating meant that his two qualifying games had to be against opponents more than 400 points above him. These 21 games consisted of seven wins and 14 draws. Among the draws particularly good results were those of Imogen Camp against an (open) IM 350 points above her, of Jon Blackburn as Black against a near 2500 Danish IM and of Sam Jukes against a Woman IM from Kazakhstan. Sam with Black goes for it from the outset, overplays his hand a bit but recovers and finds a neat perpetual. We whittled down the seven wins to a short list of three, though it has to be said there was not a lot in it. 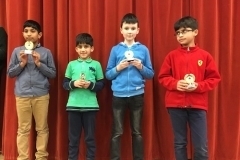 Among the four games which did not quite make it to the short list Jon Blackburn’s important last round Olympiad win featured a very well conducted final phase. Jon’s willingness to mark time earlier on (like Tigran Petrosian of old) showed considerable maturity and understanding of the position but inevitably the game does not flow as well as one might expect of a winning entry in this type of competition. It was hardly John Fletcher’s fault either that his opponent played rather weakly at the crucial stage in response to John’s swash-buckling gambit. which arose from his opponent’s rather dubious opening, reacted robustly to the latter’s attempt to break the position open and preserved his advantage through to the endgame. The judges were unanimous in awarding the 2018 trophy to Allan Pleasants for that game. We are already collecting games for the 2019 competition but there is no certainty that we will net all those qualifying from published on-line sources. There is also no need to wait until the year end before sending to me those that meet the eligibility rules. These rules are summarised above and available in full on the WCU website. Annotated games are as usual most welcome. Here are the scores of the short-listed games.